This brilliantly illustrated, amusingly observed tale of Mallards on the move has won the hearts of generations of readers. Awarded the Caldecott Medal for the most distinguished American picture book for children in 1941, it has since become a favorite of millions. This classic tale of the famous Mallard ducks of Boston is available for the first time in a full-sized paperback edition. Make Way for Ducklings has been described as "one of the merriest picture books ever" (The New York Times). Ideal for reading aloud, this book deserves a place of honor on every child's bookshelf. Robert McCloskey (1914-2003) wrote and illustrated some of the most honored and enduring children's books ever published. He grew up in Hamilton, Ohio, and spent time in Boston, New York, and ultimately Maine, where he and his wife raised their two daughters. 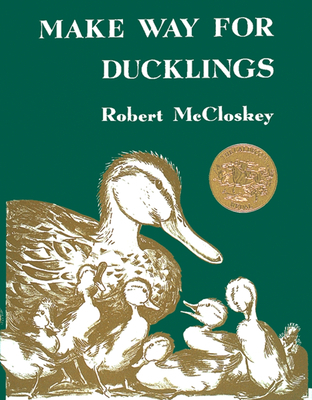 The first ever two-time Caldecott Medal winner (for Make Way for Ducklings and Time of Wonder), McCloskey was also awarded Caldecott Honors for Blueberries for Sal, One Morning in Maine, and Journey Cake, Ho! by Ruth Sawyer. He was declared a Living Legend by the Library of Congress in 2000. You can see some of his best-loved characters immortalized as statues in Boston's Public Garden and Lentil Park in Hamilton, Ohio.